Bara Brith (Speckled bread) is a traditional Welsh bread recipe. 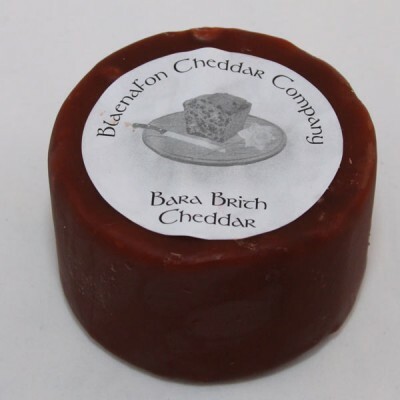 This cheddar imitates this by being blended with plumped juicy raisins and mixed fruit which has been infused with 'Black Mountain' liqueur, a medieval apple and blackcurrant brandy produced by the Celtic Spirit Company. The cheese is covered in a rich brown wax.